Despite that the green, mean-spirited and cynical character originally created by Dr Seuss has become a Christmas icon. And this year he’s back with a new animated film. Honda on the other hand, loves Christmas. Every year the brand holds its Happy Honda Day sale to give adults that childhood feeling of getting something they really want; a great deal on a new Honda. This year to put a unique twist on the holiday event, the automotive brand teamed up with Universal Pictures and Illumination’s Dr Seuss The Grinch to create a fully-integrated and inspired brand experience using the unlikely Christmas hero. The festive campaign was launched with a US television ad in a primetime Sunday evening slot where the mischievous Grinch popped up at a Honda dealership to declare that he stole Happy Honda Days. No decorations. No discounts. No exciting test drives. NO CARS! And he doesn’t stop there. Even Honda’s social media channels were not safe from the curmudgeonly character. 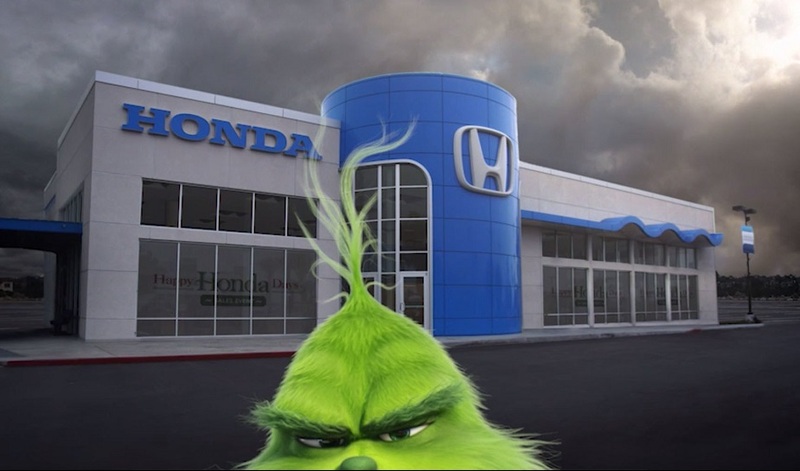 Spreading his unhappiness online, The Grinch took over Honda’s twitter to declare that he had cancelled Honda’s annual sales event and claimed to steal the deals, the cars – even the smiles – simply because it was too happy. 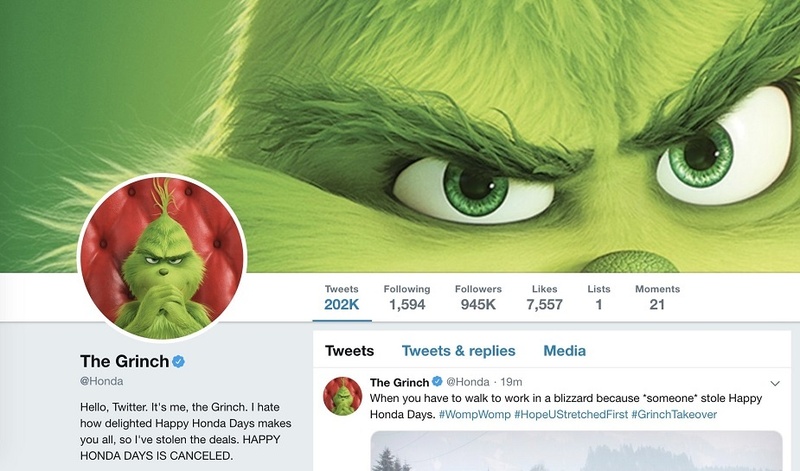 The brand’s profile and header image were swapped over during the takeover and The Grinch shared his trademark unhappy and unmerry holiday comments, featuring the hashtag #GrinchTakeover. To direct social media users to Twitter, The Grinch also hijacked Honda’s Instagram, Facebook, Snapchat and YouTube channels. The hilarious takeover featured GIFs and other highly-shareable content to appeal to younger adults. Curiously, the brand has since deleted the tweets, which is unusual in a social takeover but could reflect its mission to bring festive cheer back to Happy Honda Days. 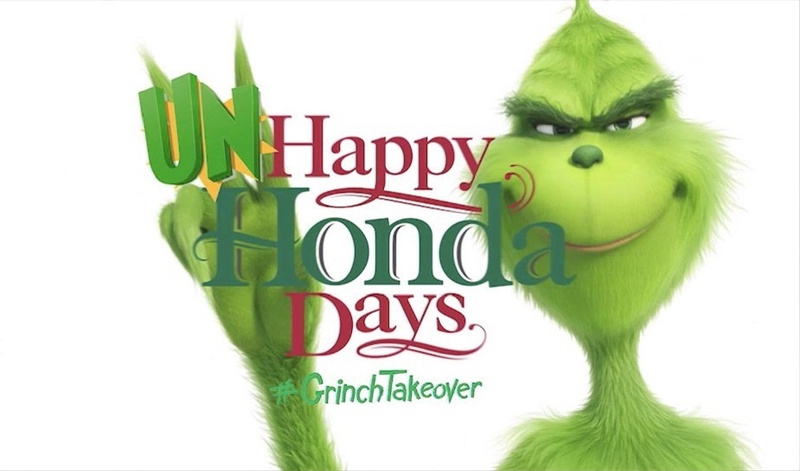 To conclude the campaign, Honda ran a follow-up TV ad; will The Grinch have a change of heart and return the cars, the deals and the Honda Twitter account? Will Happy Honda Days be reinstated? With this campaign, the brand sought to cut through the noise of traditional Christmas ads and build brand love with a memorable holiday campaign. Throughout October, Honda brand sales fell 2.5 percent so it was important that the brand created a Christmas campaign that packed a punch, and it certainly did. Brand partnerships built around new film releases can tap into film fandom and create unforgettable experiences, like the time when Madame Tussauds brought Ghost Busters to life for a whole new generation and Xfinity created a real-life Fast and Furious experience.